Drinking ginger tea benefits people with diabetes by alleviating diabetic complications and symptoms. Ginger tea is a household herbal remedy for anything from cold to cancer. Well, research has come up with one more health benefit of ginger tea and this time the diabetics should be happy. Regular consumption of ginger tea has been found to reduce or prolong kidney damage in people suffering from diabetes. Ginger root is grated and boiled with water. The decoction is strained and lemon or honey added for flavoring. Ginger tea is very effective for common cold, cough, etc. How Does Drinking Ginger Tea Benefit Diabetic Patients? Diabetic patients, who consume ginger tea regularly, can put off kidney damage to a very large extent claim researchers. Another very interesting discovery which study on ginger tea revealed was that ginger contains high amount of zinc which plays an important role in production and secretion of insulin. Insulin is the hormone that regulates blood glucose levels and diabetics complain of low insulin production. A decrease in zinc levels can affect insulin levels leading to diabetes symptoms. Thus, regular drinking of ginger tea can supply the body with zinc which in turn can help in maintaining insulin production. Drinking one or 2 cups of ginger tea, a day can benefit people suffering from diabetes. Nevertheless, it is important to take prescribed diabetic medications as advised by the physician. Initiation of any herbal tea treatment like drinking ginger tea should be conducted under the supervision of the physician only. Obesity, dyslipidemia, hyperglycemia and insulin resistance influences type II diabetes. A plethora of herbal medicines are claimed to effectively control diabetic symptoms. The root of the ginger plant is commonly used as an alternative treatment for this metabolic disorder. However, consult a specialist before self-treating with any herbal therapy. Ginger, Zingiber officinale, continues to be used as an important dietary spice and herbal medicine worldwide. Gingerols, the major pungent components of ginger, are known to improve diabetes, including the enhancement of insulin secretion, glucose clearance and prevention of other diabetes-related disorders. The March 2011 issue of the "International Journal of Food Science and Nutrition" included a study to compare the abilities of various extraction methods of ginger to inhibit enzymes relevant to type II diabetes and inflammation. The researchers quantified the compounds and found that an ethyl acetate extract showed higher activity compared with other extracts. The study concluded that ginger has potential inhibitory effects against the tested enzymes, specifically, α-glucosidase and α-amylase, which are relevant for diabetes management, and cyclooxygenase for inflammation. The development of cataracts is a common occurrence in chronic diabetic patients. An article appearing in the August 2010 issue of "Molecular Vision" reported the potential of ginger to prevent cataract development in diabetic mice. Diabetes was induced in the rats; they received either a 3 percent ginger supplementation or a placebo in their diet for a period of two months. Cataract progression was monitored and the researchers found that ginger not only delayed the onset but also the progression of cataracts. 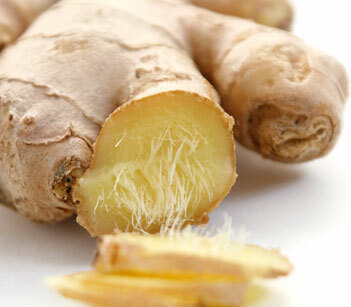 They concluded that ginger was effective for the prevention or delay of diabetic complications. The significance of blocking hormonal molecular pathways is well established with respect to anti-diabetic effects. In the December 2009 issue of the "European Journal of Pharmacology," researchers investigated the effects of various ginger extracts known to interact with serotonin receptors, which inhibit insulin release. The authors found that this condition can be reversed by two different ginger extracts, spissum and an oily extract. After treatment, the researchers found that blood glucose was decreased by approximately 35 percent, and plasma insulin levels were increased by approximately 10 percent. The authors concluded that serotonin receptor systems are involved in modulating insulin release and that various ginger extracts can be used to improve diabetic symptoms. Apart from its traditional uses, ginger extract has been used to control metabolic syndrome, a condition marked by diabetes and dyslipidemia, a disturbance in fat metabolism. The May 2009 issue of "Basic Clinical Pharmacology and Toxicology" included a study of the protective effects of an ethanol extract of Zingiber officinale on the development of metabolic syndrome. Increases in body weights, glucose, insulin, total cholesterol, LDL cholesterol, triglycerides, free fatty acids and phospholipids in plasma of test animals were significantly reduced by Z. officinale treatment. However, no significant change in serum HDL cholesterol was observed in contrast to control groups. The authors claim to provide scientific evidence to substantiate the use of Z. officinale for preventing metabolic disorders.